It seems timely, then, to talk about our current Social Studies unit on My Family. We want to preface this post by saying how much we appreciate everything you’ve done as parents to nurture your children’s sensitivity when talking about serious ideas. We’ll explain below. We love listening to our children share about their families. The Kindergarten children really cannot wait to tell us about the most important people in their lives: their parents, brothers and sisters. At what age does it die? We have admit, that last question caught us off guard. The class became quite still, aware of the depth of this question. We weren’t expecting anything so sophisticated, and there was definitely a pause as the adults in the classroom looked at each other and pondered what to say. We looked at those innocent eyes and gently said, “Most of the time, it lives a long and healthy life….” The children looked thoughtful as we waited for their response, but they seemed to accept what we said and we moved on. 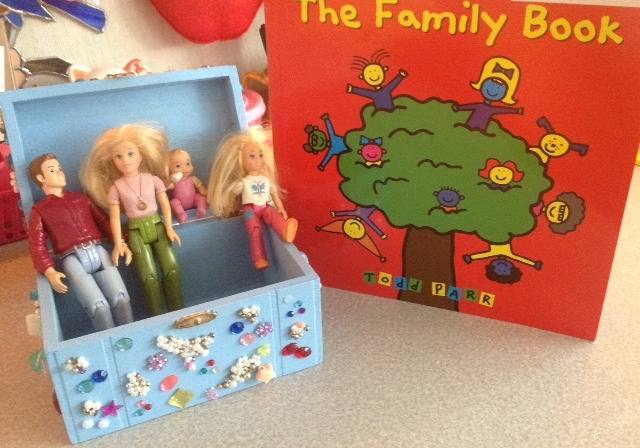 We read the beautifully written book, The Family Book (2003), by Todd Parr. Todd’s book tells of many different kinds of families, big families, small families, families of different colours, but his main message is that all families are unique and because of that, each family is special. One important idea that came up for discussion is who stepbrothers and stepsisters are in a family. 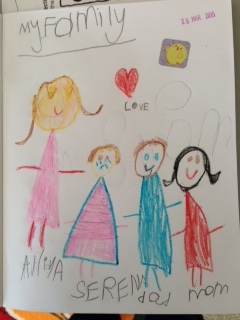 Indeed, the blended family is very special, and the children of blended families in our classrooms were able to clearly articulate the role of each family member. Charmingly, they made the comparison to Cinderella and the stepmother and stepsisters to help their classmates understand. We also talked about being adopted and what that meant. One of the children brought up what it means to be an orphan and how an orphaned child would need a new family. We’re delighted with the the amazing connections our little learners make as they relate what they know, and the experiences they’ve had, to what we are learning about at school. We brainstormed about family members, and it was fun to hear about the children’s stories (“My dad’s brother lives in an apartment!”). Our students really love the time they spend with their extended family members, as they spoke enthusiastically of holiday meals, shared vacations and big family outings. drawing themselves, “Me,” and from there we added our Moms, Dads and brothers and sisters. We were amazed with how many children knew how to spell their brothers’ and sisters’ names already, or were able to figure out most of the letters from their knowledge of alphabet sounds! Wow! 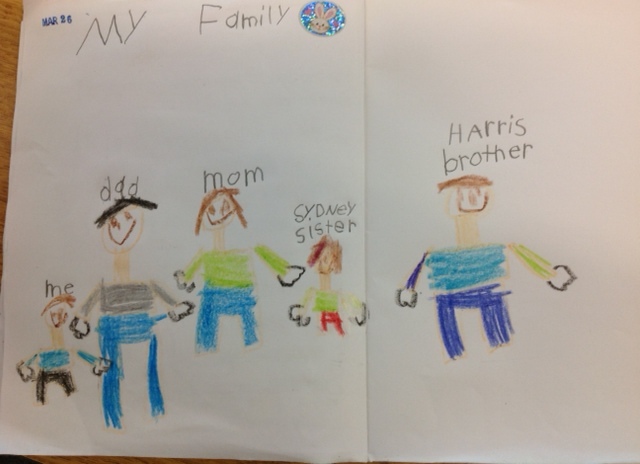 Although we’re focusing specifically on the topic of Family now as part of the Kindergarten Social Studies curriculum, we’ve tried to weave in learning about our families at other times of the year. In December, we shared our family’s Christmas traditions and special decorations. This past January we brought photos of our families to school, and shared our families’ favourite activities to do together. We’ve also been learning about families during our Library time. We cannot underestimate, as a teacher or parent, how deeply you can be moved by the depth of understanding and language of a young child. Even after our many years of teaching, events happen and things are said in your classroom that you are never fully prepared for. That is probably one of the greatest joys in teaching. You’re always learning life lessons from the best teachers you ever had: your students.